Here we go! Not only is that the latest slogan for Bud Light but it’s also how I approach my giddy approach to whenever the Sci-Fi Channel releases one of their Sci-Fi Channel original movies. Today’s original from our friends at Cinetel films and director Paul Ziller, a duo that is responsible for far too many of these original films, we have ‘Iron Invader’! write this, I see that it has everything to do with this movie. You see when the Iron Invader started attacking there’s only eight people in this town running from the Iron Invader and that’s because the freaking banks foreclosed on everybody in this town forcing them to leave and thus kept casting cost real low for the powers behind this movie. I get it now. Anyway, Jake and Ethan are working on a house when they see a comet fall from the sky. They check it out, load the comet in the truck and take it to Earl the Junk Meister (Donnelley Rhodes). Sure they probably should’ve called some authorities because things falling from space isn’t usually a good thing, and sure our own government should probably be aware of things falling from space and crashing into ‘Iowa’, but we will move on. What Jake and Ethan didn’t notice was this weird green goo on the metal that apparently has the ability to animate metal. When they get to Earl’s place they see that Earl has just built a seventeen foot robotic looking statue for the upcoming town celebration, despite the fact there are only eight people left in this town. Regardless, Earl pays them for the junk, the junk crawls onto the statue, Earl is knocked out cold and the Iron Invader is on the prowl. Back in town Jake sees that his high school sweetheart Amanda (Nicole De Boer) is back in ‘Redeemer Iowa’ visiting. Apparently Jake hasn’t had a girlfriend since Amanda went away to college twenty years ago, got married, got a career and had a child. That’s pathetic. Anyway the Iron Invader is stomping around town, grabbing humans by the throat and sucking them dry. 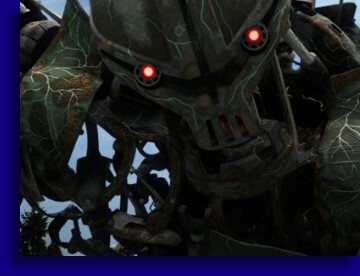 Jake in particular is upset at the Iron Invader for crimes committed against him personally and he is swearing revenge! Wait one minute… You mean to tell me this town in ‘Iowa’ of only eight people and only two cops has a Medical Examiner? Talk about a waste of my taxpayer dollars. Exactly how many times does this cat have to perform autopsies? Before today, never I bet. Anyway, nobody knows why this thing is stomping around town sucking people dry, with most folks blaming Earl the Junk Meister, but good thing the high school sweetheart is a Biology Teacher and thus is blessed with the movie knowledge explanation gene. Apparently the green goo is some kind of alien bacterial mold that feeds on metal. Human blood is full of metals. Of course I would think that there are way more tasty metals in an old Ford Pickup than a thirty year old man but then I’m not an Iron Invader so what would I know? I do know that the Iron Invader has to be stopped or the population of ‘Redeemer Iowa’ will go from eight to zero. Nobody wants that. So while I’m still waiting for one of these Sci-Fi Original movies to be good, at least ‘Iron Invader’ wasn’t so bad that it left me questioning my very existence on this rock. Paul Ziller must direct one of these things a month and thankfully, unlike the last few ‘science run amok’ joints that Ziller helmed in ‘Ba’al the Storm God’, ‘Ice Quake’ and ‘Stonehenge Apocalypse’… clearly I watch way too many Paul Ziller ‘Science run Amok’ films… they kept the fancy science talk down to a bare minimum. If the filmmakers had opted for a Nuclear Physicist and a Molecular Genetic Biologist as their leads instead of a carpenter and a science teacher then it would’ve been unbearable. But since they had BC doubling for Iowa and apparently Canadian filmmakers don’t think Iowanians are all that bright, they kept it real simple for us on the scientific tip. 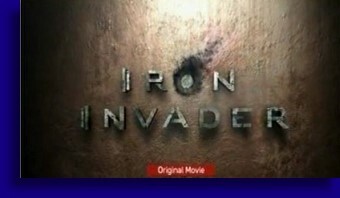 The Iron Invader looked good, looking like it actually belonged in the scene as opposed to some bad CGI creation, the performances were tolerable, since the fancy fake science talk was kept to a minimum, with more emphasis put on our character fleeing from shards of metal being tossed at them from some guy behind the camera, which means we had more action in this movie if not inspired action, and all in all ‘Iron Invader’ wasn’t so bad. I mean it’s still not a good movie, not even close to a good movie… it moves too slow at times, it is completely forgettable entertainment and characters do really stupid things like disposing of an alien that feeds on metal at a junk yard… seriously, those damn Iowanians… but it was tolerable. Where I come from ‘Tolerable’ in relation to a Sci-Fi Original is a high flying complement.